Our strength is our team, we strongly emphasis on our team work. We cater to the objectives of our clients on their needs, and commit our self to the achievement of their goals. We shall pursue excellence in all of our professional endeavors and deliver value by exceeding client's expectations by maintaining standards of services well above the norms in the industry. 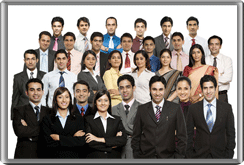 We place candidates all over India and now signed with some foreign companies.